To travel by car is possible and necessary,and it should be done now, and on what you have. 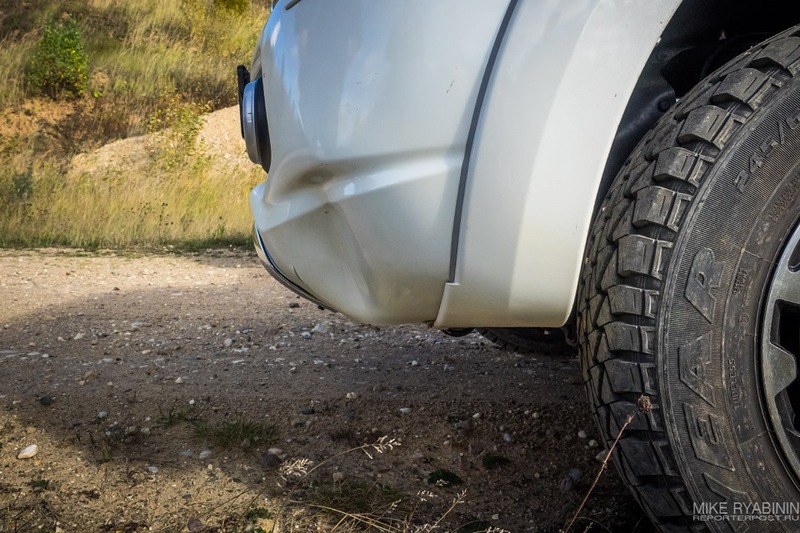 This idea I have tried and try to convey to all of my readers.At the same time I have always been a supporter of tuning off-road vehicles, but always argued for a reasonable tuning. I mean not to hang on the car all in a thoughtless fit to show off in front of girls in the city, and use only those accessories that may be needed for those routes, by which the car owner travels. In the first part I will tell you about my opinion on all this off road ugliness and the second part of the Marleson swamp discuss the need for power body kit and its relevance. Class "A", "traveling any length of negligible complexity"
This is the most simple and affordable travel for which you can use any crossover or SUV.It is possible a great pleasure to travel, for example, Renault Duster and at the same drive into interesting places and not always at great primer.If the machine is a high class type TLC Prado, the variations of routes sharply increase quantitatively and qualitatively. The main condition for such trips — in the event of potential danger and the possibility of damaging the machine or seriously stuck, it is necessary to revise the plans and ways to achieve the goal.Most often, it is to throw the car and get to the point of walkingor go to the other side, or general to refuse. Class "B" Travelling of average complexity and training. Potentially, the most promising class of travel for vehicles in Russia.In our country, a great number of interesting places to which you will pass on not always katabatic vehicle is not disfiguring his or using auxiliary means.In our country, a great number of interesting places to which you will not alwayspass onfactory vehicle without its disfigured or using auxiliary means. This does not mean that you need a winch and 35 inches mud wheels. It means that the route planning should take place in accordance with the level of vehicle preparation and equipment, and your experience of traveling.Believe me, that inexperienced driver can ruinthe car with locks, winches and 36 SIMEXand planted it so, that then would be just right to publish an advertisement for the sale of twenty bucks. The volume of training vehicle and equipment may be any and only combination of concepts "car — training — equipment" depends on the complexity of the available routes.Sometimes it is enough a reliable compressor, shovels and a saw for parsing rubble.Sometimes it is better to stock up on Sand-track and a jack (rack with lifting device for wheel or inflatable).Then it all depends on what hung on your car and where you want it to climb. Class "C" Travelling, which requires training. Serious travels, which become the evolutions of the previous classes or, conversely, which never reach, satisfied withprevious. A very small classof adepts number but allows you to say "I was there, where wolves are afraid…" Well, you understood. Class is so dangerous with possibility to damage to the car,as dangerous with possibility to harm health.Moreover, the exit on such routes just is not real for medium-level training cars and requires a serious approach. Of course, the complexity of the route depends on the weather conditions.If someone wrote to you that was "on that puddle" on the stock, but somewhere you have read, how there floundered "two trained SUV", I would have thought in your place.Not the fact that SUVs were the kettle and just decided to play in pigs, it could be a weather factor and the rain turned the ground into a solid impassable mud. Well, remember, where a chance of reaching dry land on the point you just go back on dry land? Once, I stormed passage on a vehicle without a winch and mud wheels.I went with labor but when a rain began I faced a dilemma:forward — it means only forward without a chance to go back or wait for an indefinite time, back — is not to get to the other side, where civilization has loomed in 30-40 kilometers.I chose the forward, but mudflow just stopped me erecting obstructions ahead.I managed to go back before the rain turnedprimerinto a slippery trackto the edge.If I did not manage it I would have to live on the pass to the good weather. Do you want to take the risk? God help you! 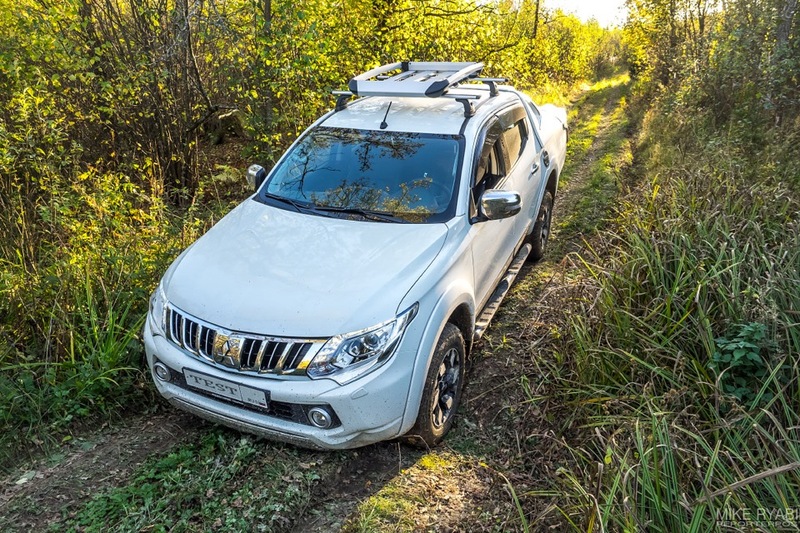 Represent the classic pickup with good off-road potential on the example of the new Mitsubishi L200 have recently visited my test. 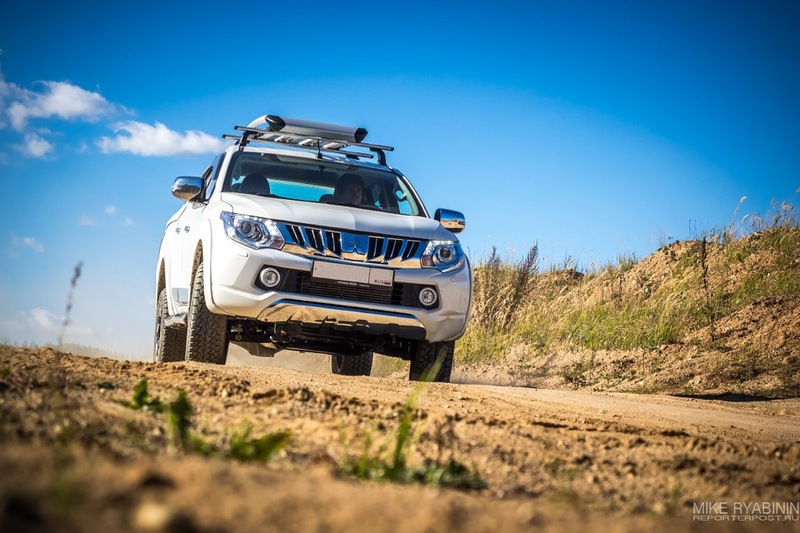 The need to exit on off-road is not discussed.If you do not need it, then you should not even read all this nonsense.Suchpickup will pass without any problems in the absolute stock to the lake, a river, on the nature. Do not torture yourself and don’t spendmoney for something that you don’t need! Forest path on which we went justwas light and some Suzuki Jimny there would be skipped without noticing, but we are not in the Jimny. Therefore, being in a small ditch and got a lesson a little earlier and we are cautious and go out to assess the prospects. As you can see, in the nursery of the complexityditchL200 teetering already on the verge.Do not forget that behind the bumper, 1.5 cm from the bottom panelis radiator and at that moment it shakes his whole aluminumbeing.Protection simply must have! Good protection, which covering the bottom of the bumper and the front part of the bottom. 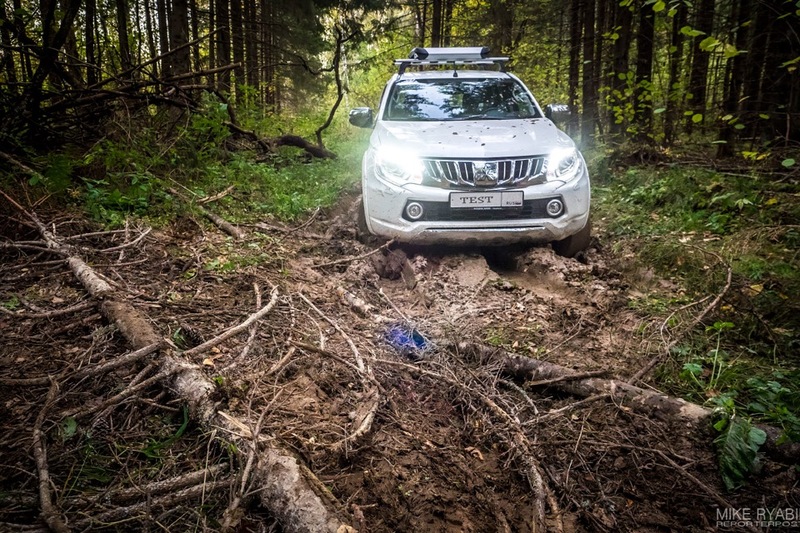 We go further and bristling in small dirty hole with fallen trees on the other side.we go through a holeto cheer, what showed L200 the previous generation, but we know about the increased overhang of the front bumper and refuse to go further. In principle, it was possible to make out the obstruction, but it is long and dirty, and then followed another obstruction.It was possible to go round, but the detour is guaranteed scratchsides, or we will have to wage clearing the channel.In general, the mass of options, but we choose the most adequate and throw the idea. What would happen if we had a good defense or front booster? We would drive the route without a danger to break something and tear sides.Simple would drove, and then would reach to an interesting place — a desired destination.If there is no desire to go there, you can move 5-6 km on foot. Our plan is not included it. It does not mean that you need a power bumper! It means that define your objectives and if they are beyond the endurance of plastic, then it is necessary think about solutions.If not, then you should not hang on car excess weight, because the tuning is not just strength, and a range of activities and investments. What happened without the protection and booster? Earlier, I mentioned the obtained lesson, and it was received child's situation that simply could not happen.A small hump hitting duringget off with asphalt was pass the previous L200 even noticing (it has protection but not touched hump). The new L200 with long muzzle at very low speed and snagged with bumper and…Bumper minus, minus washer tank and miraculously did not go to the minus radiator. 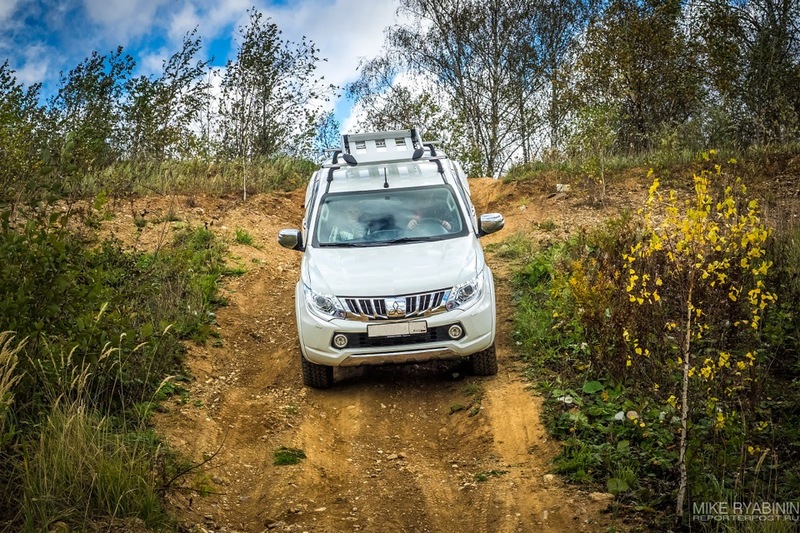 Any other comments need?Let me remind you, it was so ordinary climb-downthat it would be possible go round it or not go at all.But we're at a real off-road pickup truck and don’t took into account only increased overhang of the front bumper. Yeah, goofs! Yes, very trusted brand aware of its potential. Finally, the issue of back booster.For many pickup owners it is not a question but simply a mandatory item after buying a car.Look at the charming design of thisbutt. Now imagine the arrival of "torpedo" in the rusty bowlOooh … Enjoy it. And for those who still drives off the asphalt like the fact that 80% of pickups no rear towing eye and cling rope just not for that.The rod under the body sustained, but we drove very carefully and not very deep. We are sure that will not go further? Tuning should be reasonable and correspond to your routes!